A series of price bars isn’t always trended, of course, but sometimes you can misinterpret what you’re seeing if you aren’t careful. You may see a series of higher highs but forget to make sure that each bar has a higher low and is an up day. Or you see a series of lower lows but forget to check that the high is lower or that the bars are all down days. You may see a price series where every day brings a new high, but every day also brings a close lower than the day before and a low that’s lower than the lows on preceding days (as shown in this figure). This figure reminds you that it’s not enough to have a series of higher highs in an uptrend — you also have to have higher lows. 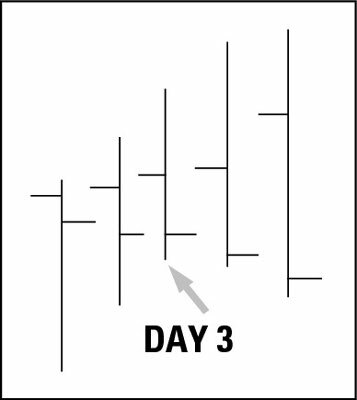 This set of bars is a series of down days (the close is lower than the close the day before). It’s hard to swallow, but this figure displays a downtrend emerging at the third bar. Your eye may want to see an uptrend, but when you look more closely and analyze the bars for all three conditions, you have only one uptrend condition (higher highs) that’s more than offset by the two downtrend conditions (lower lows and lower closes). Appearances can be deceiving. Some traders plan to exit at the end of the day no matter what. This is a risk-management decision, not a commentary on the price. Some group in the market wants to see this security make higher highs, and so they buy near the highs, hoping that a new high will “create demand,” as in an auction. Such buyers may be insiders or option traders trying to trigger a specific price level. A trader may be trying to test a support or a resistance line.